In chemistry and cooking, many substances dissolve in water to make it either acidic or basic/alkaline. A basic solution has a pH greater than 7, while an acidic solution has a pH less than 7. Aqueous solutions with a pH of 7 are considered to be neutral. Acid-base indicators are substances used to determine roughly where a solution falls on the pH scale. An acid-base indicator is either a weak acid or weak base that exhibits a color change as the concentration of hydrogen (H+) or hydroxide (OH-) ions changes in an aqueous solution. Acid-base indicators are most often used in a titration to identify the endpoint of an acid-base reaction. They are also used to gauge pH values and for interesting color-change science demonstrations. Perhaps the best known pH indicator is litmus. Thymol Blue, Phenol Red and Methyl Orange are all common acid-base indicators. Red cabbage can also be used as an acid-base indicator. If the indicator is a weak acid, the acid and its conjugate base are different colors. If the indicator is a weak base, the base and its conjugate acid display different colors. HIn(aq) is the acid, which is a different color from the base In-(aq). When the pH is low, the concentration of the hydronium ion H3O+ is high and equilibrium is toward the left, producing the color A. At high pH, the concentration of H3O+ is low, so equilibrium tends toward the right side of the equation and color B is displayed. An example of a weak acid indicator is phenolphthalein, which is colorless as a weak acid, but dissociates in water to form a magenta or red-purple anion. 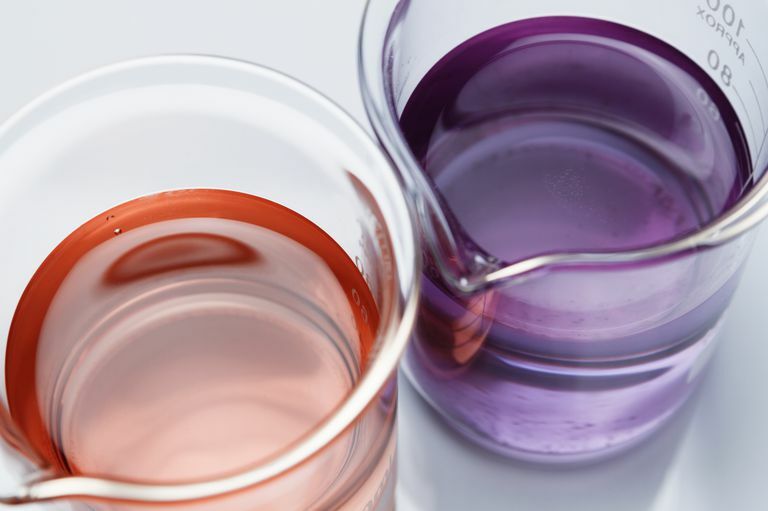 In an acidic solution, equilibrium is to the left, so the solution is colorless (too little magenta anion to be visible), but as pH increases, the equilibrium shifts to the right and the magenta color is visible. which is the point where half of the indicator is in acid form and the other half is its conjugate base. A particular type of acid-base indicator is a universal indicator, which is a mixture of multiple indicators that gradually changes color over a wide pH range. The indicators are chosen so mixing a few drops with a solution will produce a color that can be associated with an approximate pH value. The "acid" and "base" colors are relative. Also note some popular indicators display more than one color change as the weak acid or weak base dissociates more than once. Acid-base indicators are chemicals used to determine whether an aqueous solution is acidic, neutral, or alkaline. Because acidity and alkalinity relate to pH, they may also be known as pH indicators. Examples of acid-base indicators include litmus paper, phenolphthalein, and red cabbage juice. An acid-base indicator is a weak acid or weak base that dissociates in water to yield the weak acid and its conjugate base or else the weak base and its conjugate acid. The species and its conjugate have different colors. The point at which an indicator changes colors is different for each chemical. There is a pH range over which the indicator is useful. So, the indicator that might be good for one solution might be a poor choice to test another solution. Some indicators can't actually identify acids or bases, but can only tell you the approximate pH of an acid or a base. For example, methyl orange only works at an acidic pH. It would be the same color above a certain pH (acidic) and also at neutral and alkaline values.